Alba Berlin finished its Turkish Airlines Euroleague campaign on a winning note by beating Unicaja Malaga 55-68 on the road on Thursday night. The game was decided by one run in the first quarter, in which Alba surged ahead and never led its lead slip back to single digits. Jekel Foster paced the winners with 13 points. Derrick Byars added 12 –including two big baskets from beyond the arc – in addition to 5 rebounds. The Berliners bow out of the competition with a 4-10 mark and seventh place in Group E. Txemi Urtasun and Luka Zoric both netted 12 points to lead the hosts, who also finished their Euroleague run. 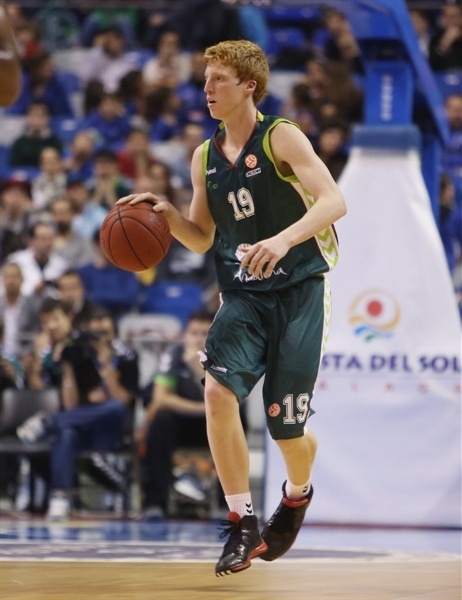 Unicaja dropped to 7-7 and finished in fifth place. Alba Berlin’s Deon Thompson got the scoring moving with the opening basket of the game, but there were few points scored in the first half of the first quarter. Fouls and turnovers were more frequent, as both sides focused on inside play. It was up to Thompson to increase the pace and he sent down a dunk that put Alba up 5-8. After the first timeout, a pick-and-roll move allowed Byars to find space to put in a three-pointer for the visitors, followed by Foster beating the shot clock from downtown. That mini-run from Alba was a sign of what was to come, but beforehand there was a brief battle of three-point shooting. Unicaja’s Earl Calloway took Foster’s shot as an invitation to respond with a triple of his own, then the trio of Byars, Foster and Calloway were joined by Alba’s Nihad Djedovic and Unicaja’s Krunoslav Simon in scoring from outside. When the dust settled, the score stood at 14-17. Into the final minute of the quarter, Alba stretched the lead to 11 points with Byars’s second successful three. It was a quarter dominated by shooting from beyond the perimeter – five players had converted from distance – turning what had been a low-scoring period into a 13-24 finish and making the first significant advantage for Alba. A pair of Ali Traore baskets before Heiko Shaffartzik added his name to those scoring from downtown took Alba Berlin’s lead up to 17 early in the second quarter. 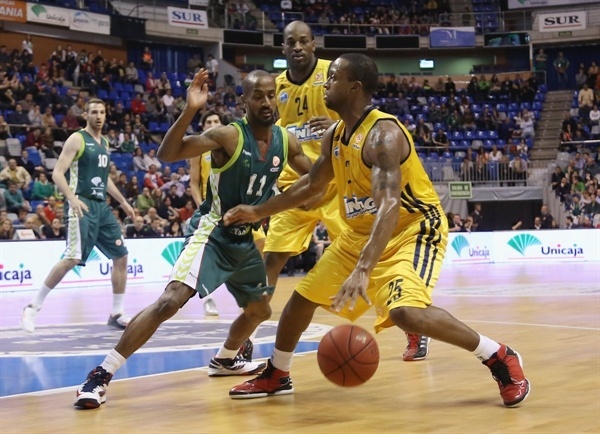 Unicaja’s way back in looked to be through Marcus Williams. Alba’s Sven Schultze scored another triple to cancel out Williams’s effort, as the German team continued to pull away. However, a drought for both sides followed on offense, in which just three baskets were scored in the space of almost four minutes. Alba’s previously promising scoring form turned ice cold, as it only scored 3 points in the closing six minutes of the half –all from the free throw line. 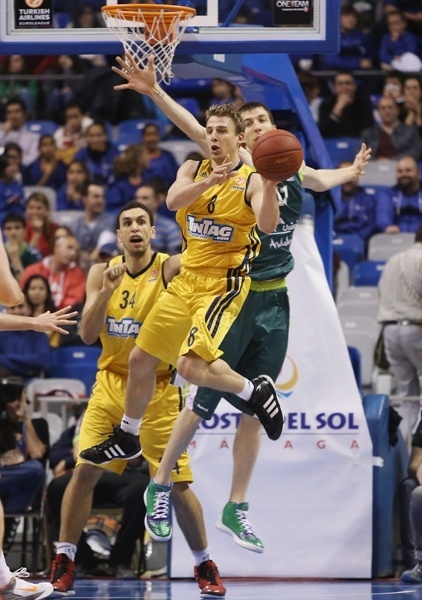 That included an uninterrupted run of 8 points from Unicaja, which had its eye on a comeback. 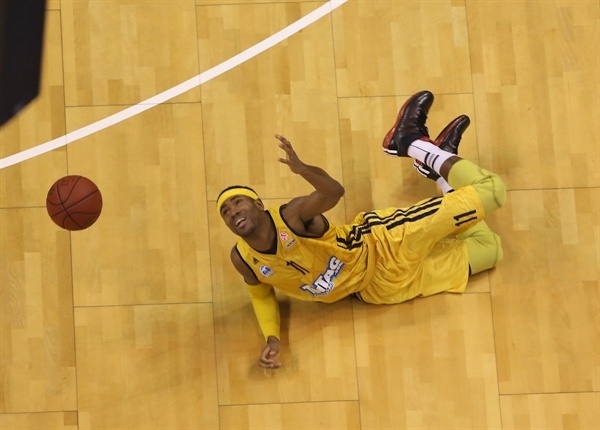 The second quarter concluded with the score 27-40 in Alba Berlin’s favor. Unicaja came out of the blocks strongest in the early going of the second half, as Sergi Vidal made an immediate impact with a three-pointer. 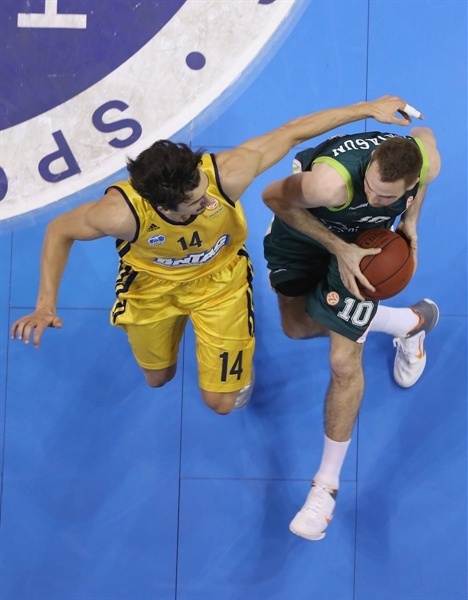 Simon provided one of the passes of the game for a Zoric dunk, as the hosts continued to bite away at Alba’s lead. Once again, the visitors went outside to reestablish control of the game, relieved by a Foster triple that quieted the crowd again. A pair of Albert Miralles slams added to Alba’s tally, as it kept maintained a lead that fluctuated between 10 and 14 points as the quarter went on. Txemi Urtasun led the way for Unicaja in scoring, but was still unable to break past single-digits and the home team needed more. The quarter ended with Miralles free throws and a buzzer-beating three-pointer ruled out, leaving the score at 38-52 going into the final period. The biggest lead of the game, 21 points, was established in Alba’s favor at the start of the fourth quarter. A spectacular reverse layup from Byars capped that run, leading to a Unicaja timeout to regroup. Calloway sank his second three-pointer. 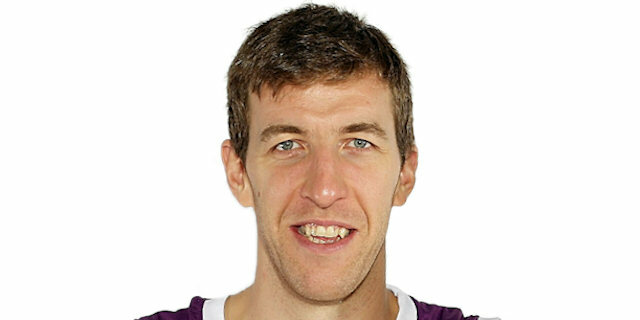 Then Zoric had the fans hanging onto the chance when he put in two unanswered baskets, before getting knocked to the floor and being subbed off due to a hit to his head. The score had been cut to 47-60, and Unicaja kept a glimmer of hope alive later with an Urtasun shot from downtown, which made it a 12-point game. Alba decided to focus on running down the clock and finding the easy layup, which came inside from Byars off a Zach Morley assist. 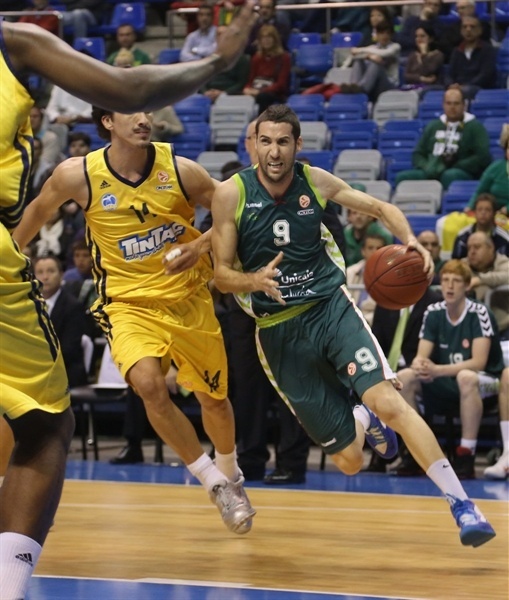 Unicaja was never able to get back within single digits, and Berlin took the victory. "It's a shame, because I wanted to finish the Euroleague with a win. We must now focus on the Spanish League, starting with the game on Saturday. I tried to prepare everyone for this game – the fans, team, organization. We must always go out to win or die. I think that the team has gone beyond the expectations and that we did a good job. I am proud of my team and the Euroleague season we had, except for tonight's game." 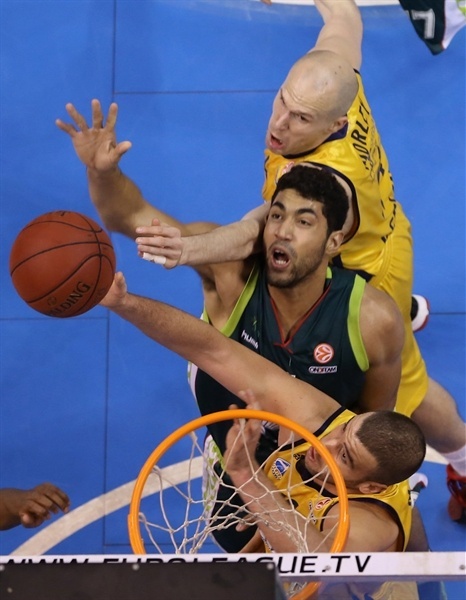 "I am very happy to finish our last Euroleague game with a win. Being in the Top 16 has been a great opportunity for us. We tried to compete in every game. We managed to beat an opponent like Unicaja, which was in great shape. We had a great start to the game and managed to keep that level." 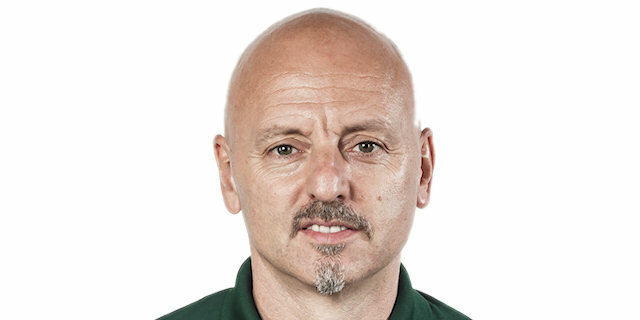 "We didn't perform at Euroleague level. We started relaxed and we paid for that in the end. 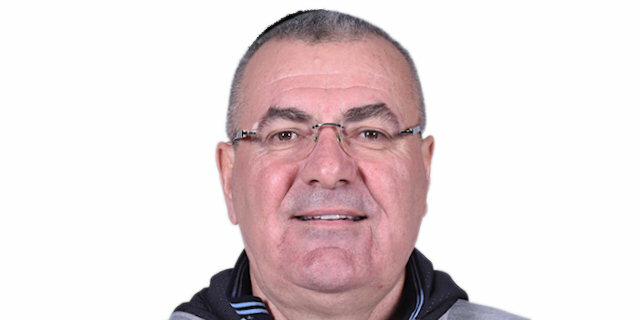 We played a great Euroleague and it's a shame to put an end to it like thos. We must be proud of our performance in this competition and now we must focus on the domestic championship."